Bagpiper Del Barund of the Antioch Bagpipers played Amazing Grace to open the Veterans’ Day Ceremony at Dayton Memorial Park on Monday. Bridget Lewis (left) and Montgomery County Commissioner Judy Dodge read the names of Veterans buried at Dayton Memorial Park since Veterans’ Day 2017. 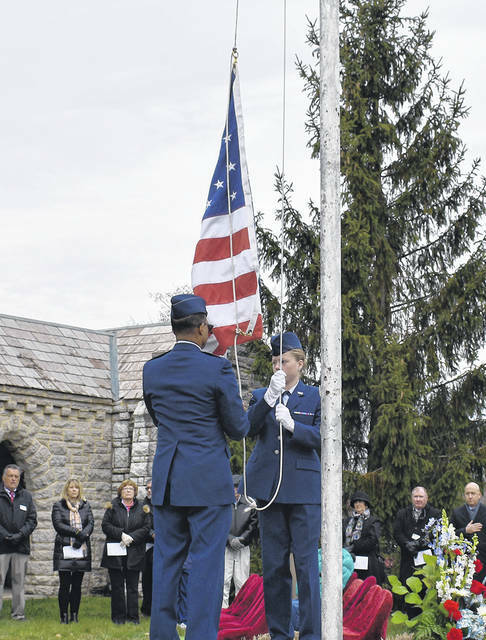 Members of the Wayne High School Air Force Jr. ROTC color guard raised the flag at the Veterans’ Day Ceremony at Dayton Memorial Park on Monday. 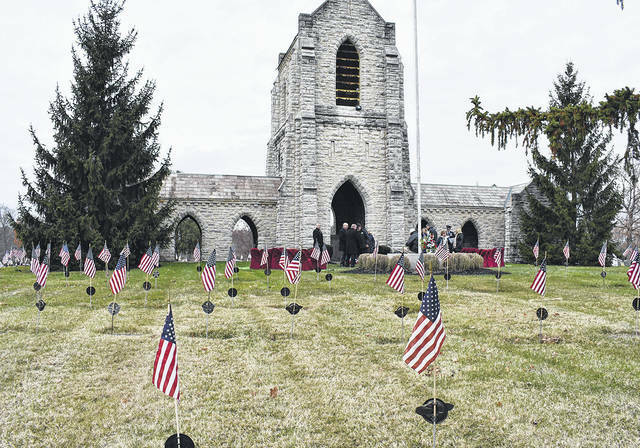 Flags were planted at each grave at Dayton Memorial Park’s Soldier’s Circle. 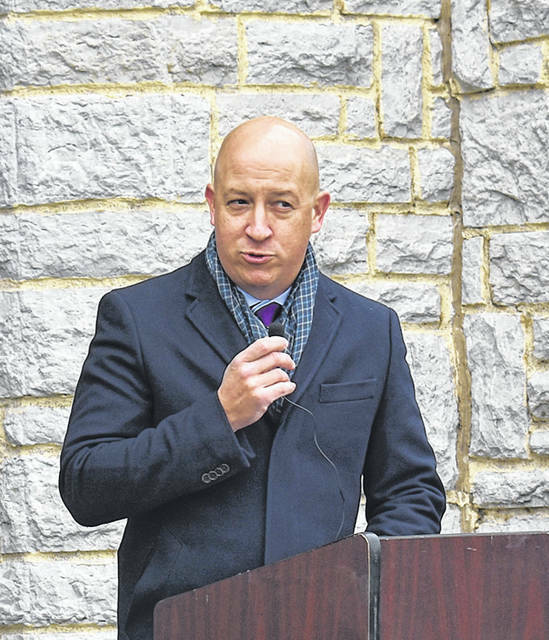 Butler Township Trustee Mike Lang gave the keynote address during the Veterans’ Day Ceremony at Dayton Memorial Park on Monday. 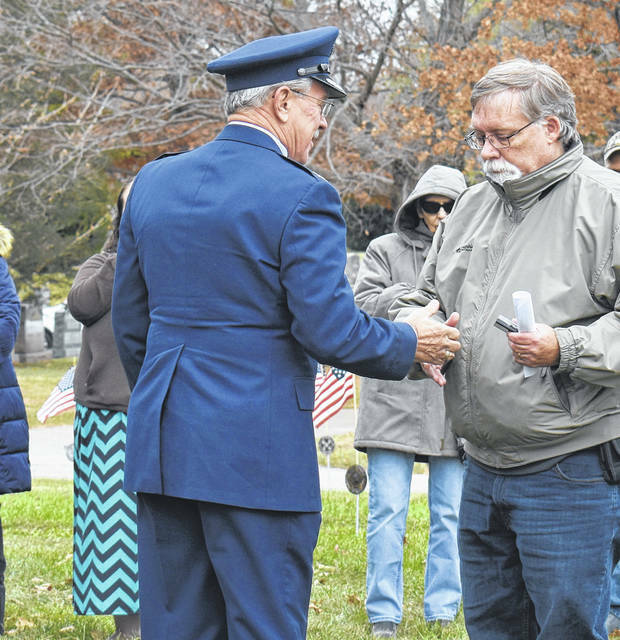 Retired Colonel Rodney Berlin (USAF) presents a challenge coin to a family member of a Veteran interred at Dayton Memorial Park in the past year. 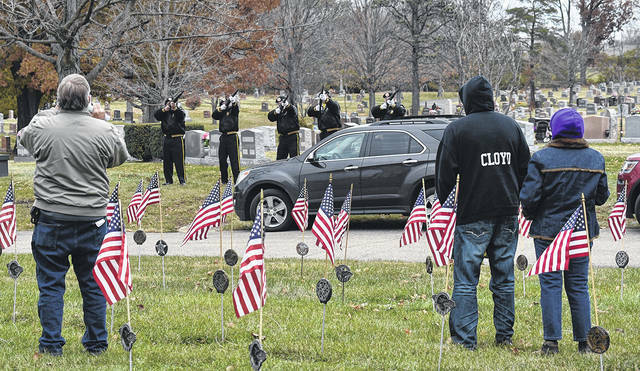 A 21-gun salute was performed by the Arkenberg-States VFW Post 6861 during the Veterans’ Day Ceremony at Dayton Memorial Park on Monday. 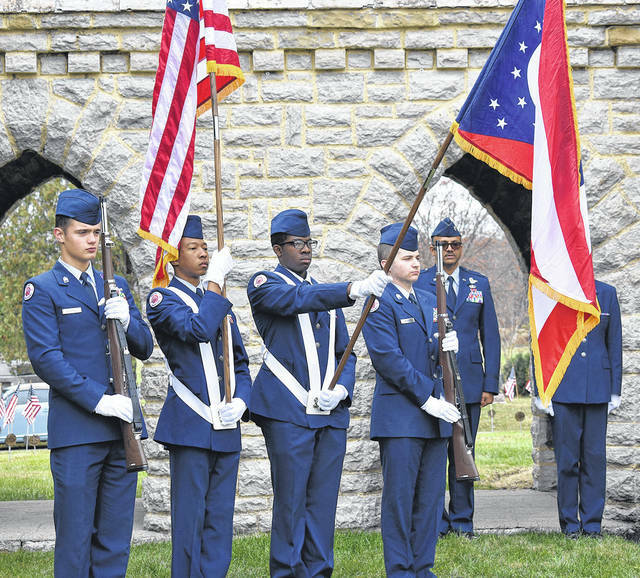 The Wayne High School Air Force Jr. ROTC color guard presented the colors at the Veterans’ Day Ceremony at Dayton Memorial Park on Monday. BUTLER TWP. 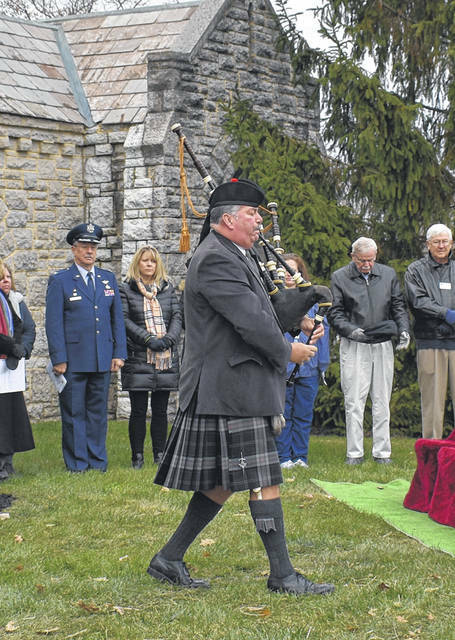 — Dayton Memorial Park held its annual Veterans’ Day Ceremony at the cemetery in Butler Township on Monday. Fittingly held in Soldier’s Circle, several local dignitaries joined to honor Veterans and their loved ones. The ceremony beganwith Del Braund of the Antioch Bagpipers playing the hymn Amazing Grace among the graves of soldiers buried around Soldier’s Circle. Sandi Maynard, a chaplain with Compassus Hospice and Pallative Care gave the invocation which was followed by the presentation of colors by the Wayne High School Air Force Junior ROTC. Retired Colonel Rodney Berlin led the assembly in the Pledge of Allegiance before Butler Township Trustee Mike Lang spoke. Lang noted that most families have someone who has served in the military at some point. 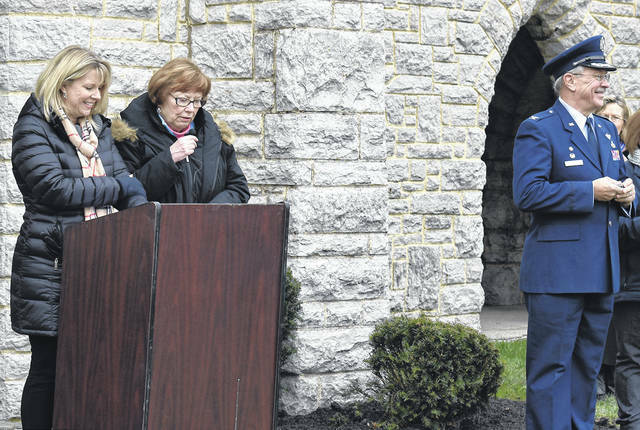 Following Lang’s speech, Montgomery County Commissioner Judy Dodge and Bridget Lewis, Volunteer Coordinator at Compassus, joined together to read the names of all Veterans buried at Dayton Memorial Park since Veteran’s Day, 2017. As each name was read, Colonel Berlin presented family members who were present with a challenge coin. The ceremony concluded with a 21-gun salute by members of VFW Post 6861, TAPS being played by Retired Air Force Master Sergeant Christopher Jeffery, and the benediction by Chaplain Maynard. Flowers were provided by Jan’s Flower Shop and Furst Florist & Greenhouses.